This wasn’t the best chase year for me, if you define successful storm chasing by how many tornadoes you see. May was a historically slow time for tornadoes, and I wasn’t in the Plains for the three-day tornado-mageddon event that produced the Pilger, Nebraska, tornado and others. 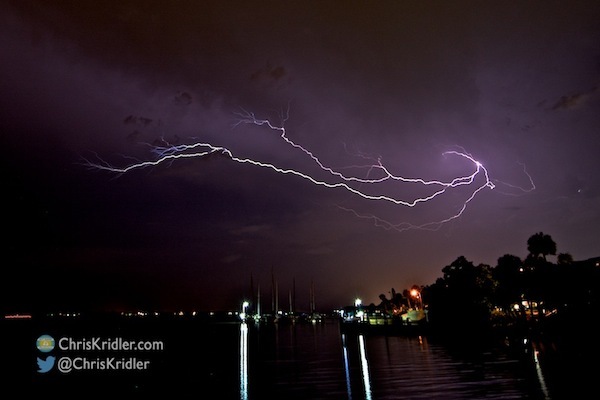 Still, I photographed a lot of beautiful storms and skies in Florida and Tornado Alley, and while I did so, I finished my research for “Zap Bang” and published it in September – the third novel in my Storm Seekers trilogy. 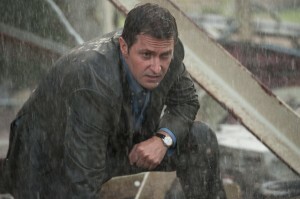 And even if I didn’t see incredible tornadoes, my characters did! Here’s a slide show that looks back at this year’s dramatic skies through photography. National Novel Writing Month is about two-thirds over, which means some 400,000 official participants – along with folks like myself who just wanted to test their mettle – are churning out copy toward the stated goal of completing a 50,000-word novel in November. I find participating in this process exhilarating. It really pushes me to write, and as a journalist, I’ve always thrived on deadlines. And I get a sense of fellowship with my fellow writers, who are airing their struggles and words of encouragement online in venues such as Twitter. If you want to look at all these writers as competition – especially with companies jumping up to sell you publishing services at every turn – you wouldn’t be wrong, either. With up to a million books being published in the United States alone each year, the chances of your voice being heard in the wilderness dwindle all the time. But at least we live in an era when we can press the button and put a book out there without being totally at the mercy of the great publishing machine. The bad thing is that anyone can press the button. More opportunity means fewer filters. The signal-to-noise ratio suffers. There’s always a trade-off. But as more self-publishers publish at a professional level, with good editing and book covers, readers start to get some real choice. Of course, readers are paying less and less for books, and therefore authors who are trying to compete on price need to sell a ton of books to make anything off all their hard work. And so the struggle continues. 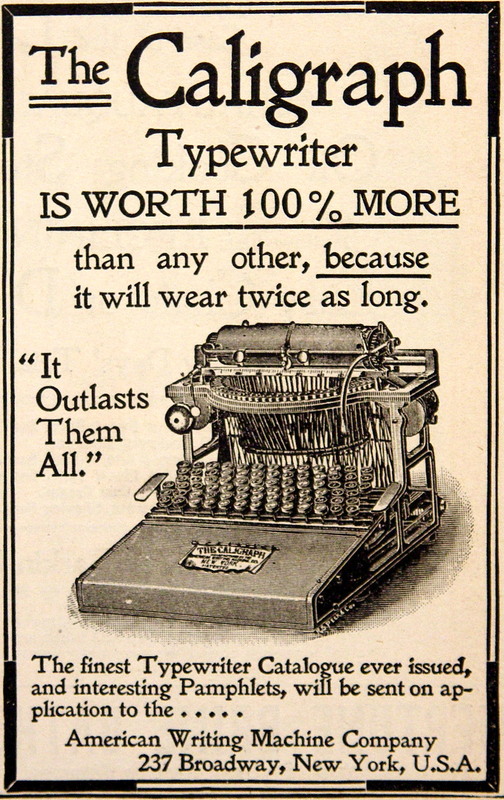 Struggle or not, I don’t think anyone gets into National Novel Writing Month, or NaNoWriMo, to make money. It’s not easy to write that many words, as a rule. They’re doing it for the challenge and for the love of the written word. This time, I’m doing it as an experiment, writing in a genre that’s new to me. Maybe it’s because of my casual approach, but I’ve found this romance manuscript to flow more easily than almost anything else I’ve written, and I’ve already surpassed my 50,000 words. I’m aiming for 70,000 and a complete novel by month’s end. I’ll probably publish this book myself, under a pen name, and because I’ve self-published before, I know a lot of work is still ahead of me. But it’s fun to be in there slugging with all the other NaNoWriMo writers this month, fighting the good fight. No matter how crazy the business has become, it’s still about the words on the page. 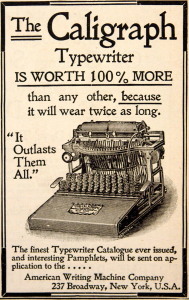 Ask not for whom the typewriter dings. It dings for thee. 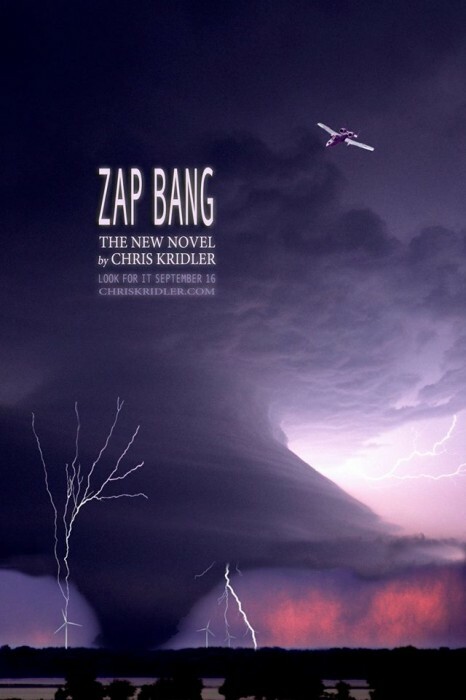 ZAP BANG, book 3 in the Storm Seekers trilogy by Chris Kridler. 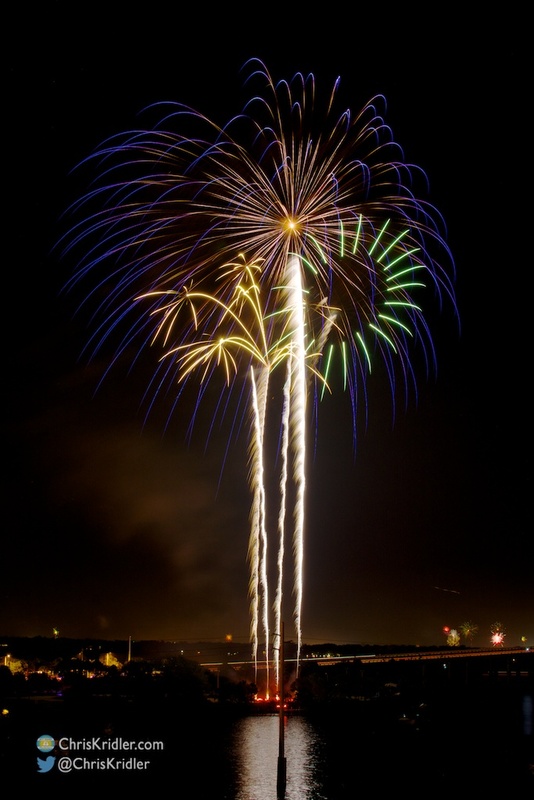 I’d like to thank all the lovely people who shared and Tweeted the launch of my novel “Zap Bang” this past week – so many great friends and indie authors on Facebook and Twitter. I’ve also appreciated the coverage from Florida Today, Florida Book News and Authors and Book Buzz, and the fun interview in Jaimie M. Engle’s writing blog. It’s hard to make oneself heard in the noisy world of publishing these days, but I heard the buzz this week! Now I hope more folks will discover the Storm Seekers trilogy over time and get into these storm-chasing adventures the way I have. To that end, “Funnel Vision,” book one, is still on sale this week on Kindle and Nook for 99 cents. You can learn more or buy any of the books via the links on this page. And – there’s still time to win stuff! The giveaway of the big Storm Seekers Prize Pack ends late Monday evening. Check it out here and enter! 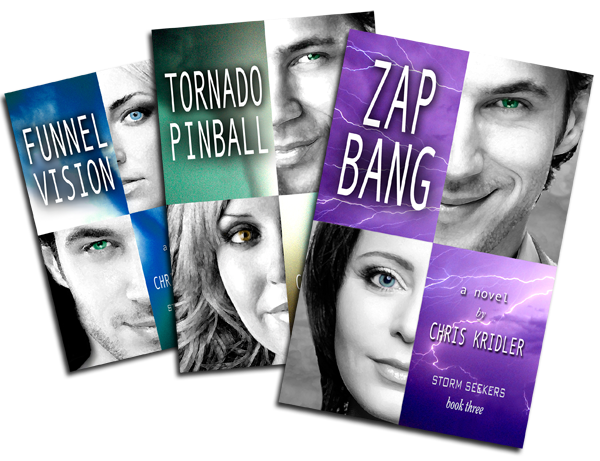 In addition, you can win a paperback of “Zap Bang” on Goodreads. The giveaway ends Sept. 30. 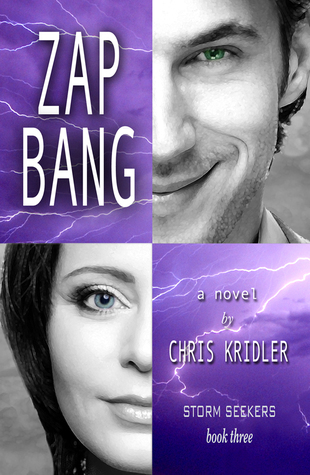 It’s launch day for ‘Zap Bang’ – Storm Seekers Book 3! 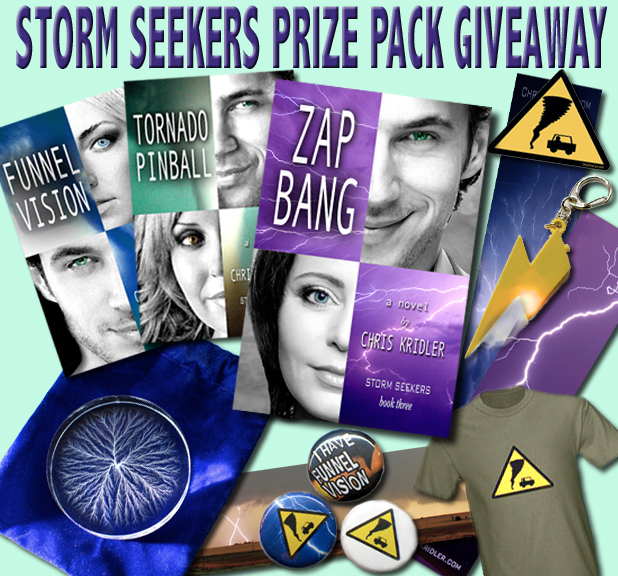 Giveaway: The Storm Seekers Prize Pack Giveaway is under way through Sept. 22. Enter here or on Facebook. 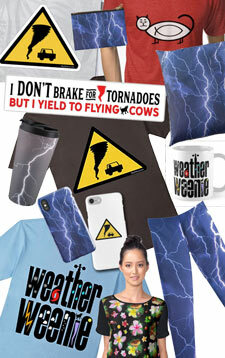 The goodies include signed paperbacks, a very cool captured lightning sculpture, a storm T-shirt and more. Via the giveaway, you can Tweet every day to stack up your entries, too. 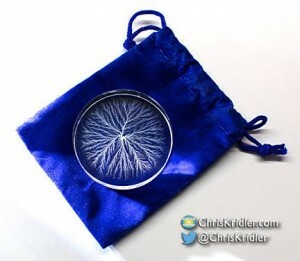 This small captured lightning sculpture is among the goodies in the Storm Seekers giveaway. 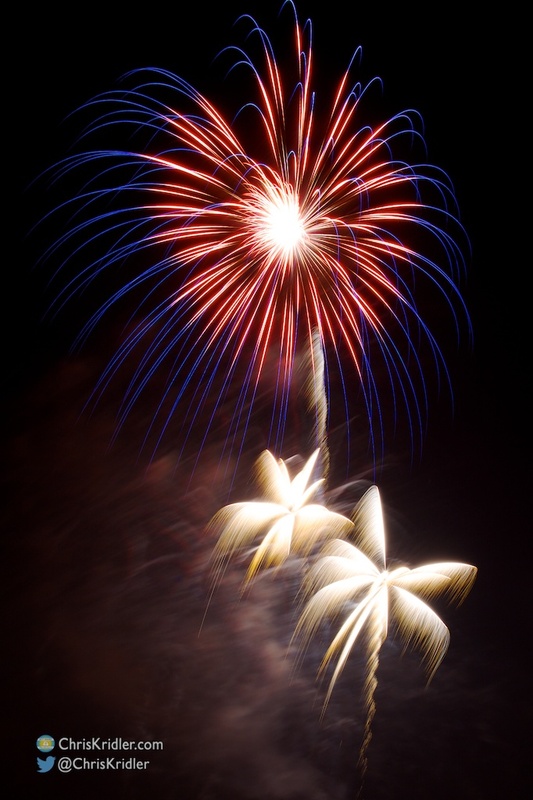 It was created with a 5 million volt particle accelerator. Funnel Vision sale: If you haven’t read the books, now’s a good time to grab the Kindle or Nook editions of Book 1 – Funnel Vision – on sale for 99 cents for a limited time. 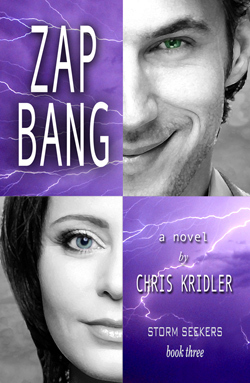 Goodreads giveaway: Go to this page on Goodreads to register to win an autographed paperback copy of Zap Bang. The entry period ends Sept. 30. For tornado chaser Jack Andreas, an invitation to a lightning study means double the danger. As he sees it, what’s not to love? He’s intrigued by the job and fascinated by pilot Maribeth Lisbon, who must fly a research plane into the zap zone. Maribeth suspects he’s trouble, especially when his charms set off all her alarms. In their way are scheming TV chaser Brad Treat and down-on-his-luck adventurer Aurelius Zane, intent on filming a wedding in front of a twister. The eccentric billionaire who funds the study has a secret agenda. And a mystic with a food truck tests them all. As fearsome storms put them in mortal peril, Jack and Maribeth find their toughest challenge may lie within. You might also like to read about the playlist I created as inspiration while I was writing the book. For more details about the books and free sample chapters, visit the books page. So there you go. Zap Bang is in the wild, and a wild, lightning-laced adventure it is. I’ll dearly miss writing about these characters, but I hope you’ll enjoy living in their world as much as I have. Happy chasing! The captured lightning is completely cool, and you’ll read about it in Zap Bang. The giveaway ends on Sept. 22, so get in your entries now! Josh Groban’s “Brave” is a gorgeous song and quite different from a lot of the rockers on my novel playlist. Every time I write a novel, I feel a compelling need to come up with a soundtrack for it. OK, officially, it’s a playlist of songs that inspire me and, in my mind, illustrate emotions and plot turns with addictive tunes. These are songs I bought so I could listen to them over and over as I write and revise. Right now, if I could wear a groove in my iPod, there would be one where the “Zap Bang” playlist is. “Zap Bang” will be published in about a month, before the official end of summer. It will conclude the Storm Seekers trilogy with a new adventure starring storm chaser and scientist Jack Andreas and pilot Maribeth Lisbon, whom readers may recall from her appearance in “Tornado Pinball.” They are called to join a lightning study – Jack on the ground, where his expertise chasing tornadoes comes in handy, and Maribeth in the air, flying an A-10 Warthog converted for civilian lightning research. The National Science Foundation is currently converting an A-10 for similar purposes, though it will be focused on tornadoes and hurricanes, not lightning. Fortunately, the realm of rock and roll is full of great songs that use lightning and thunder as a metaphor. 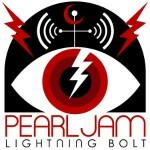 I’ll selectively mention some that appear in the playlist, starting with Pearl Jam’s “Lightning Bolt.” It’s an absolutely fantastic rocker, and it’s how I see Maribeth – she really is a lightning bolt who’s about to shake up Jack’s life. Opposite in tone is Craig Carnelia’s beautiful song “Flight,” performed by Sutton Foster and Megan McGinnis. It speaks to what I think the younger Maribeth must have felt when she first learned to fly, before the hardships she faced later in life; that kind of yearning may be a feeling she needs to rediscover. Johnny Hartman’s “Stairway to the Stars” is smoky and sultry. Speaking of rockers, how can you resist The Strypes’ “Perfect Storm”? Hunter Hayes’ “Storm Warning” gives the playlist a needed country inflection; after all, Tornado Alley is country music central. And “I Don’t Want To (Love You)” by TAT is a frenetic, humorous expression of a feeling many of us can identify with. 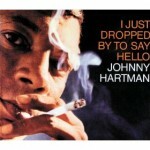 The list dips into classic jazz with Johnny Hartman’s “Stairway to the Stars,” which is mentioned in the text. Saxy tune. Pun intended. I conclude the playlist with a couple of evocative Ryan Farish instrumentals, including the aptly named “Beautiful.” If the Storm Seekers novels, which I consider quite cinematic, were ever made into films, I’d love to see one of his transporting pieces on the soundtrack. Cue the closing credits . . .
And stay tuned. “Zap Bang” is coming very, very soon! One of the reasons I moved to Florida in 1999 was to enjoy the lightning storms. 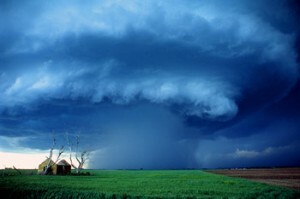 I was living in the mid-Atlantic and had gotten into chasing storms in Tornado Alley two years earlier. I looked into moving to Oklahoma, but career and geography conspired to bring me to Florida. The one thing I didn’t realize was that so few of the lightning storms in the Sunshine State are at night. Most happen during the day. And getting to a storm an hour away in Florida is not nearly as easy as getting to one in Tornado Alley. Why? It’s not just because of the traffic and road network. It’s because Florida storms tend to be short-lived; by the time you hit the road to catch that storm 45 miles away, it’s faded to a misty memory. This past week was par for the course – and the one night a little lightning hung on after dark on the east coast, where I live, I didn’t get to it until it was nearly gone. 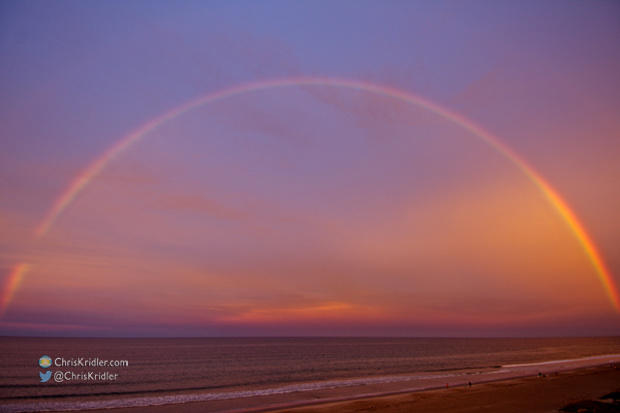 But I’ve had a crazy smorgasbord of storms upon which to feast, yielding a nice photo or two almost every day. 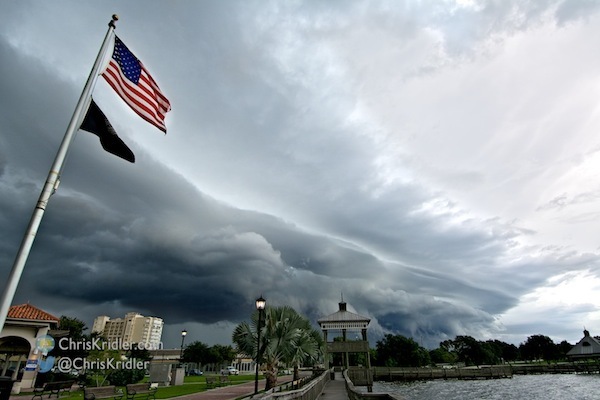 Florida has amazing striated shelf clouds, formed by cool air pushing out from thunderstorms. 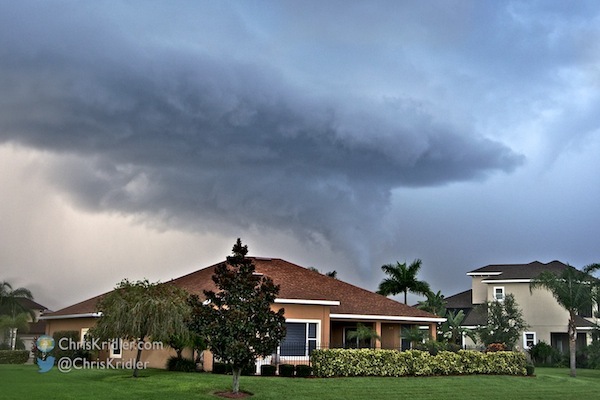 And boundary collisions tend to cause quick funnels and tornadoes; I was at a small get-together at a friend’s house when a funnel cloud (not a tornado, because it didn’t connect with the ground, at least that we saw) formed beyond their neighbors’ houses. My camera got soaking wet as I ran out in the rain in my bathing suit to try to shoot photos. What a week! 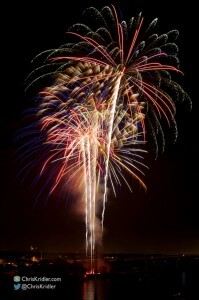 Meanwhile, I’ve been working late on revisions and editing of “Zap Bang,” the final novel in the Storm Seekers trilogy. I’m thrilled to be wrapping up the story and heartbroken to be leaving these characters. It’s coming very soon! A note for e-mail subscribers: I am phasing out the Feedburner e-mail service, since Google no longer supports it and I can no longer access it. Please use the link to the right on my site to sign up for the new e-mail list; if you get two copies, please unsubscribe from the Feedburner e-mail. I’m sorry for the inconvenience, but I’m at the mercy of the vagaries of the mega-corporation. 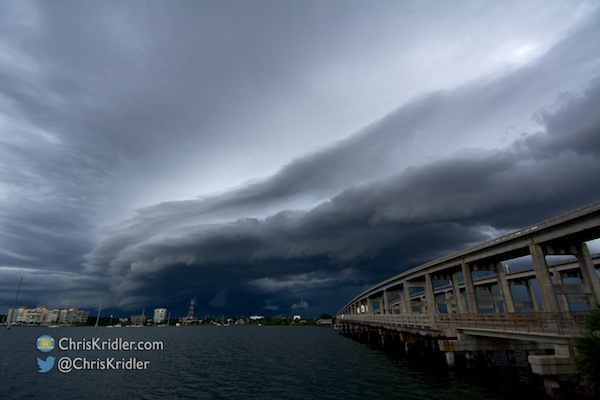 Nature paralleled the unnatural on Wednesday of this week when a beautiful striated shelf cloud moved over Cocoa, Florida, the Indian River Lagoon and the bridge over the S.R. 520 Causeway. It originated from a barely-moving severe storm farther west that sent out an outflow boundary. The shelf cloud almost mirrored the curve of the bridge as it went overhead. 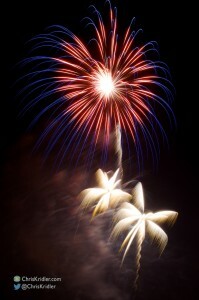 See the set of photos from this day here. 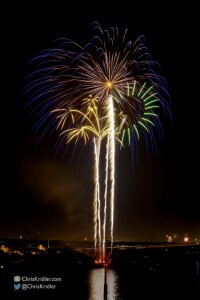 I had a chance to see Cocoa, Florida’s July 4th fireworks from a height on Friday and snapped several photos. They were taken looking toward the S.R. 520 bridge over the Indian River Lagoon. 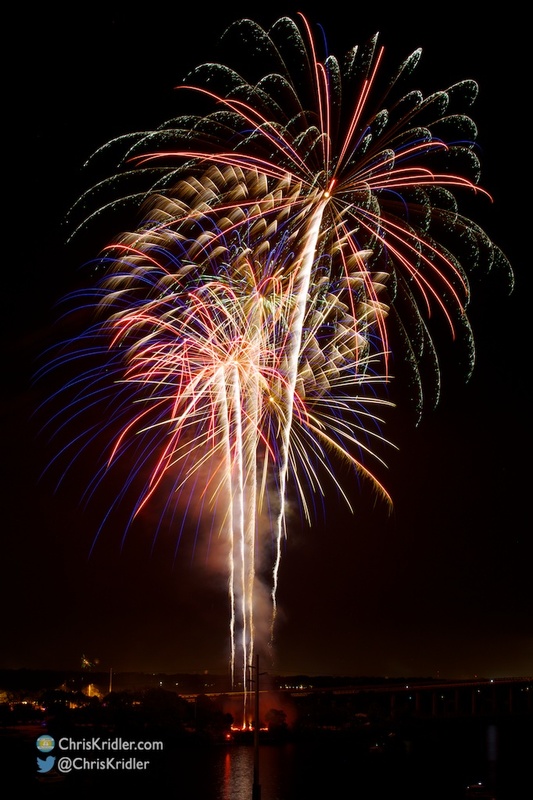 Here are a few of the more interesting explosions. Happy summer!